I am grateful we were able to take the kids to honor the men and women that served and sacrificed for our country. Next stop was the Aloha Tower Marketplace. Alan's feet were blistered so we bought him a new pair of sandals, and we had to check in for our evening dinner cruise. We are always early and the kids’ blood glucose levels were low so we stopped and had a snack at Hooters. Yes, it was my idea because I had never been there before. The food and service were bad and I am glad to say I will never go to Hooters again. Finally the time came for our Dinner cruise. 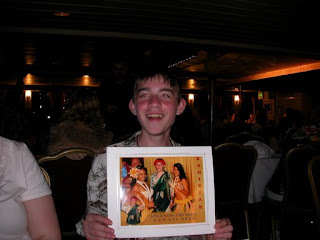 The cruise staff asked Niall to dress up and dance with some Tahitian hula dancers during the dinner show. That was fun to watch. Alaeric enjoyed the buffet and the scenery was gorgeous! 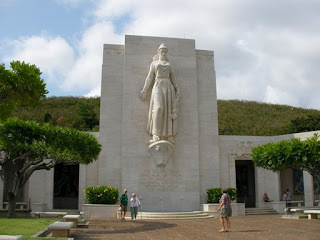 Day three on Oahu was spent doing touristy activities as well. 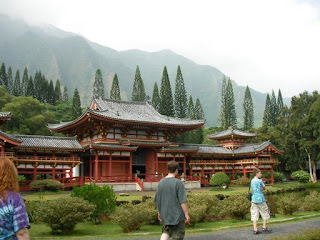 In the morning we drove to the Byodo-In Temple in the Valley of the temples. It was beautiful; set in a well-maintained still active cemetery. It was built in the 1960's (with no nails) to commemorate the 100th anniversary of the arrival of the first Japanese immigrant workers in Hawaii who came to work in the sugar plantation fields. It is a replica of the 950-year-old Byodo-in Temple located in Uji, Japan on the southern outskirts of Kyoto. The kids had fun ringing the five-foot, three-ton brass Peace Bell. They say that ringing this bell will bring you happiness, blessings, and a long life. It is customarily rung before entering the temple. The next stop on this really hot day was at the Sea Life Park. I have to say, we were not impressed with the park. The habitats were small and seemingly not well maintained. There were fewer exhibits than when I was last there in 2002. The dolphin show was cool though...too bad you had to sit in the full midday sun for an hour to see it. I will post a video of it here when I get it uploaded. There was a wholphin named Kekaimalu who was featured. A wholphin or wolphin is a rare hybrid, born from a mating of bottlenose dolphin (mother), and a false killer whale. You can see her in the video. She is the big one. We left the sea life park early because everyone was hot and cranky and wanted to play in/on/around the water, so we checked out the pipeline and dorked around the North Shore until it was time to go back to the condo. Why does time pass so quickly? It has already been almost three weeks since we got back from Hawaii and this is the first post…wow, I am a slacker! Let me just say Hawaii was amazing! We did all the typical touristy things on Oahu which was cool, but when we got to the “big Island” we kinda did our own thing which was WAY better! It is really overwhelming for me to think about writing everything that happened over three weeks, so I am just going to go with the highlights and tackle one or two events at a time. Our first day on Oahu was spent acclimating, getting the rental car (kudos, brownie points and thanks to Alan for getting GPS) and checking out Scott and Susan’s condo in Waianae where we stayed, (thanks Scott and Susan!) the kids were excited to find a house gecko living in the kitchen, made me happy because geckos eat bugs. We then decided to drive on down the road past Makaha and check out the shark boy cave, had fun taking pictures in there. We were really impressed with the waves out that far, they were only 4 feet or so, but that is a lot to us. I was surprised to see all the homeless people living on the beaches. They had semi-permanent shacks built, some with generators even. There would be clusters of these shacks all along the beaches on the leeward side of the island. Very uncool, but if you had to be homeless, what a great place! Our second day on Oahu was voggy. The trade winds were still and all the vog from Kilauea blew to Oahu. No vog will stop us so we went on a tour that circled the island. We got to ride on the short bus which was not crowded at all, met some very nice people and learned a great deal from our really nice tour guide. We stopped at Diamond Head, drove through a really rich neighborhood, stopped at the Halona Blowhole which was formed from lava tubes that run to the ocean and, when the surf is right, the blowhole shoots water up to 30 feet in the air, (they didn’t shoot that high when we were there.) We stopped at Hanauma Bay Nature Preserve and walked around, the Niall saw mongoose and his reaction was really funny. We drove by the Sealife Center and too many beaches to count. Our next stop was the Pali Lookout which was where Grandpa had asked Alan to call him, so he called and he told us a story of when he and Aunt Patti were kids and they were driving the Pali highway. You will have to ask him if you want to hear it. Anyhow, the Pali lookout is in Nuuanu Pali State Park, it overlooks the 985-foot cliffs of the Koolau Mountain Range. 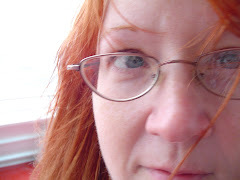 Usually it is extremely windy, but it was just kind of breezy for us. The trade winds blow through the valley between the high mountains on either side, forming a strong wind tunnel of sorts. On extra windy days, you can even lean into the wind and let the gusts hold you up. There were documented cases of people throwing themselves off the cliffs and being blown back up. Our trusty tour guide then drove us through a rain forest on the Like Like (pronounced lye kee lye kee) Highway, we stopped at a farmer’s market/mac nut farm/tourist pit next. We got to learn how macadamia nuts grow, taste coffee cherries (they are really sweet) and the boys chased chickens. Everyone was starving by this point and our driver drove us to the Polynesian Cultural Center where we got a canoe ride and buffet lunch. Alaeric went back 4 times! That really shouldn’t surprise anyone. After lunch we drove up the Windward side of Oahu to the North Shore, checked out beaches and surf along the way, stopped at a fruit stand and got fresh pineapple, papaya and drank coconut water straight from the shell. Alaeric found this funky/pretty flower there growing on a tree…we had never seen anything like it. Turns out it was a passion fruit (Lilikoi) blossom. Next stop was the Dole Plantation where we of course got a Dole Whip (pineapple sorbet/ice creamy scrumptious stuff.) It was between two or three in the afternoon and the sky let loose! We got soaked running back to the bus, fortunately the tour was just about done and we slept the last forty-five minutes. We went to Dave and Buster’s for dinner. That was an experience! Dave and Buster’s is a video arcade and sit-down restaurant all in one, kid of like a grown-up Chuckie Cheese. Alan and the kids had a blast! Alan tried dance dance revolution (oops, did I say I wasn’t going to tell anyone?) and didn’t do so great. Nearing meltdown trying to exchange tickets they had won for gifts we left. Poor Alan had to drive home with sleeping kids and wife. In order of importance; 1. I am mother to two wonderful boys, Alaeric and Niall. 2.Certified Medical Assistant and clinic coordinator to a thoracic and general surgeon. Compassion and Light: Saturday, May 2, 2009 at 8:00 p.m.